A tale set in biblical times comes to life for a literary audience. 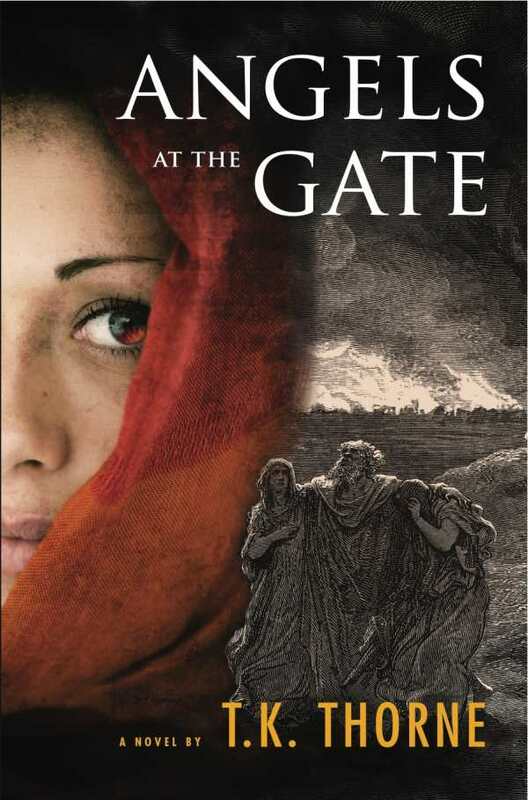 T. K. Thorne’s Angels at the Gate imagines the story of Lot’s unnamed wife. Cast as Adira in this memorable telling, the once nomadic “daughter of the wind” is an unconventional figure whose experiences—from adolescence until the moment she turns into a pillar of salt—create outstanding historical fiction. The book begins when Adira—whose mother died in childbirth and whose father, a trader and caravan master, raised her as a boy named Adir—can no longer continue masking herself. The start of womanhood brings the threat of discovery, and with it, the certainty of being sent to live with relatives Abram and Sarai. An impetuous Adira soon hatches a plan to delay her fate. She makes herself useful as a translator to two messengers of El, Raph and Mika, embarking on a treacherous journey through the desert, the king’s court in Babylon, Canaan, and Sodom. The plot is intelligently mapped and skillfully builds suspense through the knowledge that Adira’s secret must unravel. Thorne portrays ancient lands with an eye for wilderness. Whether writing on life in a caravan or the dangers of a flooded wadi, scenes unfold in crisp detail. The relationship between masters and their animals also plays a key role in depicting desert peoples. Adira’s saluki in particular stands out. The black canine, Nami, serves as a companion, hunter, and protector from the outset; she’s penned with as much liveliness as any of her human counterparts. The novel notably attends to social nuances in a culture of hospitality. Offering shelter to strangers is an act complicated by honor codes. Failure to do so can result in serious rifts. Adira tests the limits in her encounters, particularly when she risks offending a host by posing as a boy. As Adira accompanies Mika on his quest to rescue his brother Raph, her spirit shines. Numerous occasions reveal her talent for quick thinking. Adira’s final undoing—through a savage, disfiguring assault—becomes all the more tragic in light of what she could have become under different circumstances. An unusual twist involves questions surrounding Mika and Raph’s mission. The novel places them in a long line of “Watchers,” whose ties to a distant green land suggest both mystery and loss. Those more familiar with stories of Michael as an archangel may find Mika’s course unusual; the focus on a special stone that aids him in his rites may seem hazy. Still, there is plenty to admire in this work, which capably shifts from an adventuresome portrait of a strong protagonist to a story steeped in bereavement. A tale set in biblical times comes to life for a literary audience.